Buying a New Home? Tree Removal Might Be in Order! When it comes to buying a house, there are so many decisions that need to be made. Deciding on a home can be a huge undertaking. Is this home right for your family? Is it what you were looking for? Does this house suit your needs? Does it fit your budget? Is this the right neighborhood? Are the surrounding schools a good fit for your children? If you do not like the current landscape of your new home or feel like you are living in the forest instead of Orlando, call the tree removal company in Orlando. We can help remove anything from low-hanging branches to dead, free-standing trees. Interestingly, as of 2015, around 15 billion trees are cut down annually in the U.S.A. Tree removal is at an all-time high and according to research, the world consumption of paper has grown 400% in the last 40 years. Now nearly 4 billion trees (35%) of all trees cut around the world are used for a paper on every continent. During processing most of the individual tree is used: wood used to make paper is mostly sawdust and wood chips from lumber mills. Lumber companies are another leading industry that needs trees for lumber. From the 2×4 boards used to build a house to the air we breathe, trees are essential. Trees are downed to make room for new buildings, too although this wood is rarely wasted and will be used to make furniture, paper, and boards. Just like anything else, when treated in a factory, wood produces by-products that are used for other nonrelated things. When wood for paper is heated and turned to pulp, the thick gummy substance known as cellulose cannot be dissolved. It’s separated from the paper pulp and used in asphalt, paint, chewing gum, detergents, turpentine, deodorants, floor tiles, rayon clothing, sandwich bags, toothpaste, etc. It’s also recycled as food additives and wood alcohols are used in colognes and solvents. In fact, latex gloves are a by-product of trees, coming from Hevea Brasiliensis (the rubber tree) that is tapped for its rubbery sap. Many household sponges are made from cellulose wood fibers. Wine corks come from the cork oak. The original chewing gum was derived from the sap of the sapodilla tree. Car wax is made from a certain type of palm tree native to Brazil. Hair dye and henna tattoos are the powder of the henna tree. Garden mulch is recycled pallets, ground up and dyed to make mulch. Usually, tree companies collaborate with landowners who have sizable forests on their property, taking trees of a pre-negotiated size, and will leave the rest of them on the acreage to grow bigger. The company will pay the landowners for their trees, according to the size of the harvests. This is a beneficial and economical way of foresting trees in the United States. While clear-cutting woodland rocks the ecosystem, only cutting a select size of tree leaves the remaining trees to grow and mature. This is much healthier for the woods because it stimulates and enables new growth to take place. The younger trees are then allowed more sunlight, water, and nutrients from the soil since the mature trees are gone. 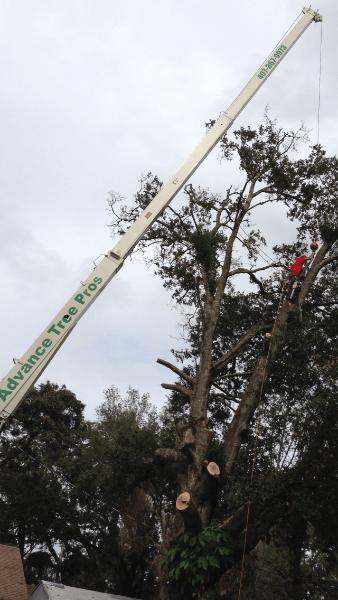 Advance Tree Pros is an affordable tree removal service in Orlando, Florida that offers fast, professional work. Everyone here at the Orlando tree removal service is proud of our 100% recycling policy, and that our prices never climb. Our highly skilled ISA Certified arborists are ready to assist you with any tree-related issue you may have, whether it is an entire tree or a stubborn stump. With our fleet of bucket and crane trucks, we can reach all of those hard-to-reach places and get trees down safely. Taking care of dead or in-the-way trees can not only be difficult, but it can be dangerous, too. If there are electrical wires, houses or buildings, fences, roadways, or wildlife nearby, it is best to let the job of safety-conscious professionals. Come on in and talk to us about getting rid of the problem in a safe and efficient manner. With some of the best tree removal prices in Orlando, we are more than happy to help! Are you ready to go out on a limb and give us a call?